Recent observations of the Atlantic deep ocean overturning circulation, called the Atlantic Meridional (north-south) Overturning (up-down) Circulation, or AMOC, also known as the Great Conveyor Belt, or Thermohaline Circulation, shows that it has been decreasing since 2004, the time for which detailed measurements are available from the RAPID program. Climate models also predict a decrease for the future due to man-made global warming, but the observed decline, shown as the red line in the below figure, is much larger than that predicted by the models. At a recent meeting of oceanographers in Bristol, UK, scientists were wondering what could cause this discrepancy. Stength of the Atlantic Meridional Overturning Circulation as measured by the RAPID program (red) and reconstructed back using sea level (black; from Frajka-Williams, 2015). 1 Sv = 1 Sverdrup = 1 million cubic meters per second. Before I tell you more about the reasons for this mismatch let me give a brief background on the issue. 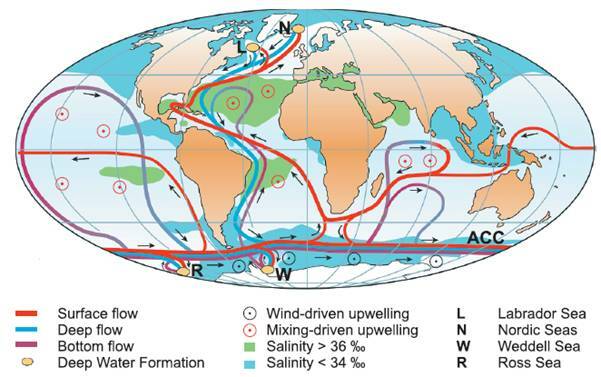 The global deep ocean circulation is a system of currents that connect the surface and the deep ocean. It moves huge amounts of water, heat, salt, carbon, nutrients, and other chemical elements around. Schematic diagram of the ocean’s meridional overturning circulation. From Kuhlbrodt et al. (2007). The red lines in the above figure show the warm surface currents, whereas the blue lines show the cold deep ocean currents. In the Atlantic the surface flow is northward from the South Atlantic across the equator, around the tip of Florida (there it is part of what is known as the Gulf Stream), and then further north towards two areas close to Island and Greenland where the cold and salty water is so dense that it sinks to depths greater than 1-2 km. This is called North Atlantic Deep Water (NADW). The cold deep water then flows south along the coast of North America, crosses the equator again and continues its way along the coast of South America until it enters the Antarctic Circumpolar Current (ACC) in the Southern Ocean. From there it flows into the Indian and Pacific oceans, where part of its upwells back to the surface. Another part, presumably most, upwells in the Southern Ocean. The part that upwells in the Pacific flows back through the Indonesian Archipelago into the Indian Ocean, and further west around the tip of South Africa back into the Atlantic. Around Antarctica there are also regions where surface waters are very cold and dense and sink to the sea floor. This water, which is called Antarctic Bottom Water (AABW), mixes with NADW to form Circumpolar Deep Water and flows into the Pacific and Indian oceans (purple lines in above figure). Density of sea water depends on temperature and salinity. It is most heavy when it is cold and salty. Because only the heaviest waters sink to the deep ocean, this process called deep water formation, happens only in a few regions near the poles. The importance of salinity can be seem in the above figure by contrasting the North Pacific, which is fresh (blue, low salinity shading) and where no deep water forms, with the North Atlantic, which is salty (green shading). It has been known for about 20 years that human-made global warming would likely diminish this circulation because warmer surface waters are less dense and thus less likely to sink. Moreover, because warming also causes an faster water cycle (more evaporation, more precipitation, and more northward freshwater transport in the atmosphere), the deep water formation regions will become less salty, adding insult to injury. Climate models project about a 20-30% decline in the next century for a business as usual scenario. The total flow rate of the AMOC is about 20 Sv, thus the models indicate a rate of decrease of about 4 Sv/100 yr, whereas the observations, shown in the top figure in red, indicate a rate of decrease of about 4 Sv/10 yr, so an order of magnitude faster decline. However, looking the extended AMOC (black line in top figure) suggests that the rate of decrease over the last 20 years was smaller than that over the last 10 years. In fact, there appeared to be a consensus building amongst the oceanographers at the Bristol meeting that the recent downturn of the AMOC may be mostly part of a natural variation. Models and reconstructions seem to agree that the AMOC has substantial natural variability on decadal (10-100 years) time scales. In fact some scientists think they can predict that the downturn in the recent past will continue at least 1 or 2 more years and that this could cause a pause, or “hiatus”, in the ongoing Arctic sea ice decline, or even a slight increase. The reason for this is that as the AMOC reduces, there is less heat flushing into the Arctic and thus sea ice can expand. We’ll see if these predictions will come to pass. If so, it would indicate important progress in near term climate predictability.